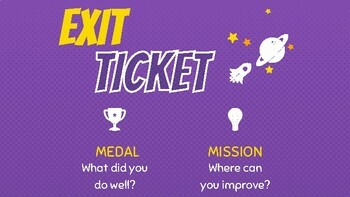 Attractive exit ticket slide to display at the end of any lesson, appropriate for all grade levels and subject areas. I have used it with students responding in handwritten reflective journals and in a Google form; both work great. I have found the scaffold is simple enough to make reflection for responsive programming of subsequent lessons. I hope you enjoy! This digital download contains a Powerpoint file, a PDF and a link to a Google Slide version.